A Family Dentist Serving the Warren Park Area Talks About Cavities! Did you know that over 90% of the population has had cavities? This common dental condition occurs when bacteria in the mouth destroy enamel, the hard outer layer of a tooth, causing it to become soft. If left untreated, it can eventually reach the nerve of the tooth where it causes an infection and subsequent toothache. As a family dentist serving the Warren Park area, we’ve treated a lot of cavities over the years. Since it’s so common, we thought we’d write a blog about the impact of decay on your oral health, as well as treatment and prevention. After all, knowledge is power – especially when it comes to your oral health! How Do Cavities Affect You? Teeth are hard to come by! You only get one adult set, and while there are some wonderful replacement options for missing teeth, nothing is as good as your own. Each time you get a cavity, your tooth loses some of its original strength. In addition, dental work itself is subject to wear-and-tear and must be replaced eventually. 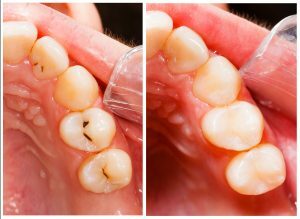 Each time a filling is replaced, the strength of the tooth is more and more compromised, which can require more extensive dental work down the road such as dental crowns. When treating a cavity, the goal of your family dentist in 46219 is to remove the decayed and damaged tooth structure and replace it with a strong, hard material that can withstand daily chewing forces. Relatively small cavities are treated with fillings. For many years, metal amalgam fillings were the only option available. Today we have white composite fillings that offer several advantages, including a better appearance and being more conservative (i.e. more of the existing tooth is conserved). Larger cavities may need a crown because there’s less healthy tooth structure available to “hang on” to a filling. For a severe cavity, a root canal may be necessary if the cavity has reached the nerve of the tooth. Brush at least twice a day with fluoridated toothpaste and floss once. Schedule regular checkups and cleanings with a family dentist on Post Road. Use a fluoridated, anti-cavity mouthwash after brushing and flossing. It will strengthen the enamel and counteract the acids produced in the mouth after meals that can cause cavities. Although dental decay can negatively impact your oral health, the good news is that modern dentistry has given us wonderful ways to prevent and treat it! 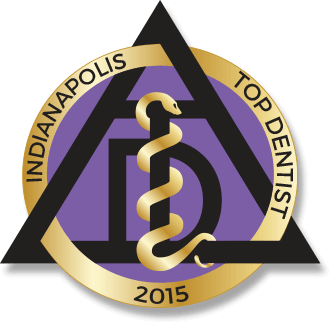 Dr. Mark Farthing and Dr. Armin Tepner have over three decades of experience each in general, restorative and cosmetic dentistry. Their goal is to help their patients have a thorough understanding of their oral health so they can prevent dental problems rather than having them treated. If you have any questions, they can be reached via their website or at (317) 898-3384. Comments Off on A Family Dentist Serving the Warren Park Area Talks About Cavities!